January 2014: My first North Carolina snow! Note: this post was originally posted on Davidson College’s Archives & Special Collections blog. I also wrote about my experience at SNCA 2014 in my Day of DH 2014 blog. Professional development is integral to all of the library staff here at Davidson College, so with that in mind, the Discovery Systems team sent three of its members to the Society of North Carolina Archivists (SNCA) annual conference last week – myself, Jan Blodgett, and Susan Kerr. While we all often attend meetings, conferences, and other trainings, we usually reserve our discussion of takeways, thoughts, and interesting ideas to in-person weekly departmental meetings. We thought that my first SNCA meeting would be a great opportunity to compare and contrast what the Davidson attendees got out of the meeting. So, first up: my takeaways! To start off the morning, Jan moderated the “Publishing and Managing Digital Collections without CONTENTdm” session, which I presented at. The session was a great opportunity to talk about our ongoing development and roll-out of our institutional repository, as well as to hear about how two other institutions are dealing with increasingly larger and larger digital collections. 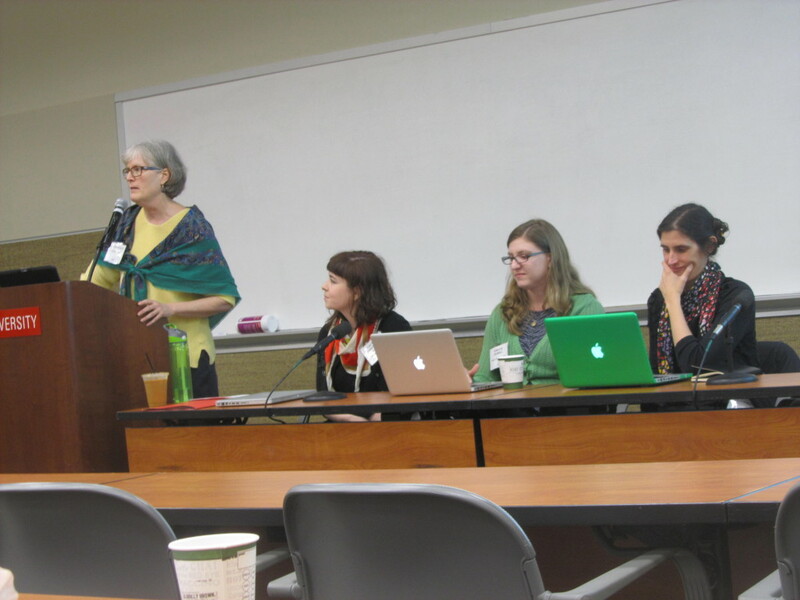 Moderator and presenters at the “Publishing and Managing Digital Collections without CONTENTdm” session. From left to right: Jan Blodgett, Caitlin Christian-Lamb, Chelcie Rowell (Wake Forest University), and Molly Bragg (Duke University). 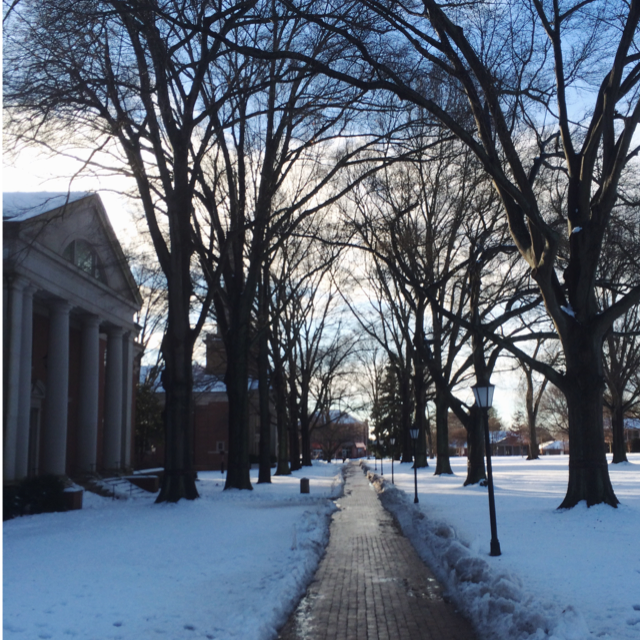 Photo via Craig Fansler (Wake Forest University); see his post on SNCA here. Molly Bragg also wrote a post about this session – read that here. Yesterday was both my first time participating in a Day in the Life of Digital Humanities (Day of DH) and in an annual meeting of the Society of North Carolina Archivists (SNCA). Day of DH seeks to help define what digital humanists DO, since that’s an oft-asked question, by having people who work in DH document one day of their work-lives. I had meant to participate in the 2013 iteration of Day of DH, but last April 8th I was stuck deep into a full thesis draft hole (plus working on a deadline for my digital libraries class, and ended up feeling sick that day to boot), so the thought of blogging about how stressed I was didn’t appeal to me at all. One year later, I realized that Day of DH would fall on the same day as the SNCA meeting, which was definitely a day I anticipated being very busy – attending a conference takes up a good deal of attention, plus I knew I was presenting on a panel first thing in the morning and was up for election to SNCA’s exceutive board (as member at large), which would be voted on during the lunch-time business meeting. Add driving across the state and back to all that, and I thought I had a pretty full plate – but that’s exactly what made it an interesting day to document, in my opinion. DH-ers do a lot of different things, and some us happen to be conference-ing while liveblogging, as it turns out! Read my Day of DH blog here, complete with SNCA takeaways and pictures! Note: this post originally appeared in Davidson College’s Archives & Special Collections blog. Generally, the first thing I do when I get into the office each morning is make a cup of tea and catch up with my inbox. On Monday mornings, there’s usually several dozen unread emails – in part because I subscribe to an assortment of professional listservs. Post-email-checking, I updated the Archives & Special Collections Twitter, and then went to a Discovery Systems departmental meeting on student workers (possible projects, how many summer students, etc.). I spent the rest of the morning preparing for a class visit to the archives later in the day (including selecting documents and setting up their display with Jan), and working on the Around the D entry to post on Wednesday morning. Sharon and I nailed down a few details related the illumination live demonstration event (set for January 28th, from 11 AM to 12 PM). After taking a late lunch (1:30 PM to 2:30 PM is my standard), I drafted a short news blurb related to the blog topic for the library’s homepage and updated the Archives & Special Collections Facebook. Then Jan and I hosted the first archives class visit of the semester, Dr. Anelise Shrout‘s HIS 458: American Environments to 1893. 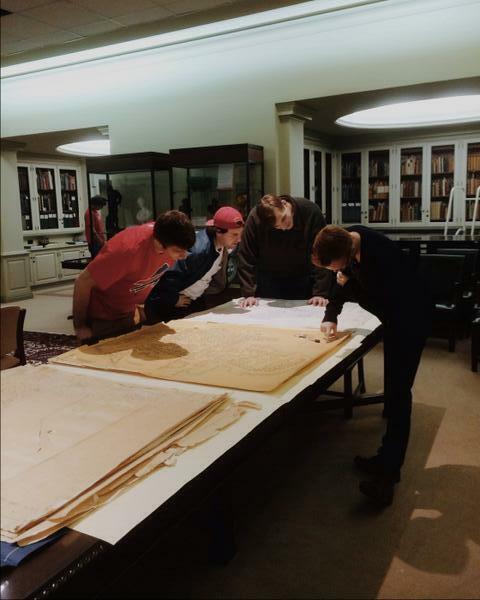 HIS 548 students checking out campus maps. When I moved to Boston three years ago, I instantly hated it – every bad day or negative emotion I had, I blamed squarely on the Hub of the Universe. It didn’t help matters that I had just spent the summer in Austin, TX (a city I was madly in love with), or that I had recently been on two amazing cross-country road trips, or that I had grown up in the shadow of NYC (Boston’s natural enemy, as I was repeatedly reminded), or that I was about to suffer through one of the worst/ snowiest winters Boston had had in years. Boston was cold, foreign, and unfriendly, and I spent the little free time that grad school and work allowed making trips down to see my Providence friends. 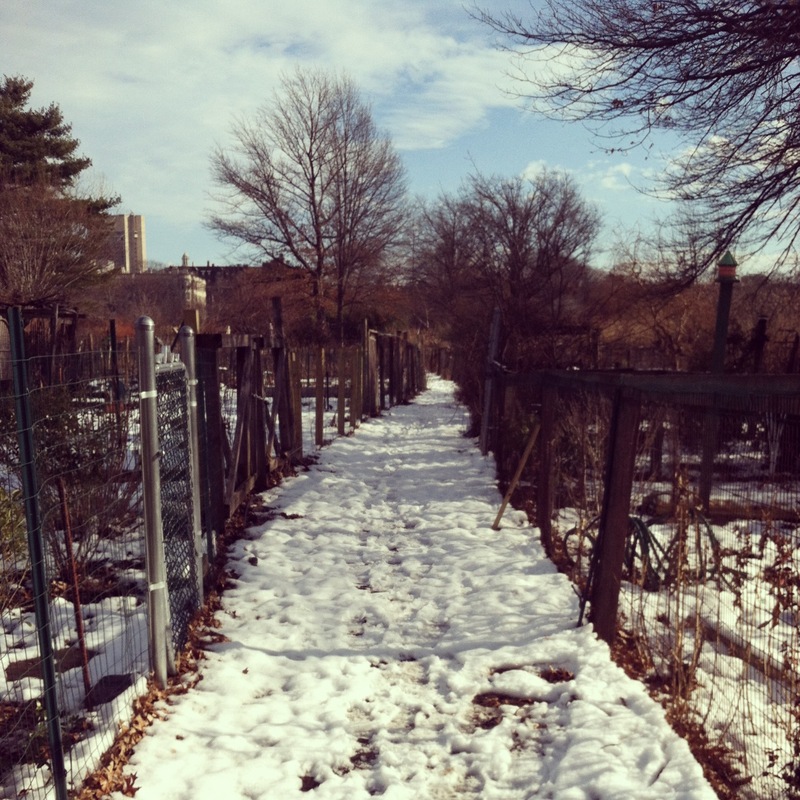 The Fenway Victory Gardens in winter. Over time though, I grew to love Boston. The shift was gradual – from outright hatred to ambivalence, and then slowly to a weird sort of love. I knew I had officially crossed over when a friend of a friend asked me where I was from, and I responded “Boston” rather than “New York” (our mutual friend overheard this, and immediately shouted, “NO SHE’S NOT! She’s a New Yorker!” But then so was he). 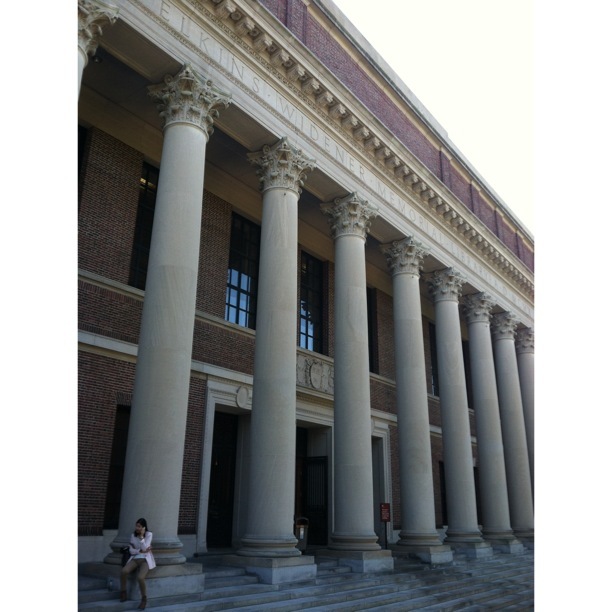 Front steps of Harvard’s Widener Library. Two months ago, I left Boston, but I didn’t really leave it – I moved home to NY but split my week between the two cities, usually taking the train east early in the morning on Tuesdays and then the bus or train back to NY on Thursday or Friday evenings. The commute was designed to save me money, not time or convenience – I could crash at my mom’s in NY, and with friends in Boston during my abbreviated work week. The commute was tiring and being technically “homeless” was an annoyance, but I didn’t mind – I love riding the train, and I liked feeling like I was traveling, even when it was only between two cities that I am intimately familiar with. I was able to hang out with my friends from college and eat delicious pizza, bagels, and potato cones, while still keeping my amazing job and getting to see all my Boston friends. I began taking long walks around Cambridge, trekking from Harvard Square to Central nearly every day, hoarding Mike’s Donuts from Roxbury in my bag while I hunted down the best lattes within a two mile radius of Widener Library (FYI, I’m pretty sure Simon’s Too is God’s Gift to Central). I wandered through the North End for no reason other than that I could. I stayed late at my office every night, met new people, read YA novels on the train, and had more fun than I’d had in months, maybe years. I was finished with graduate school, but occupying that post-grad liminal space where you’re not entirely sure what your future is going to be. 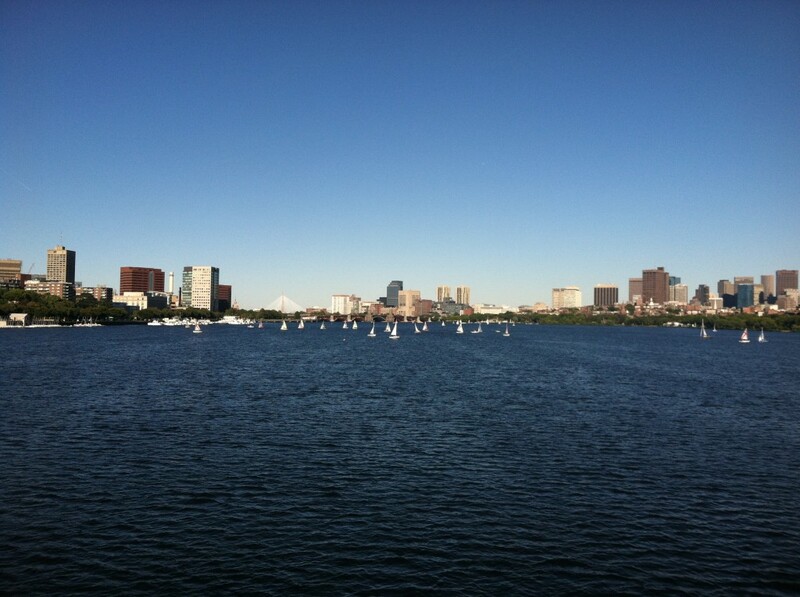 View of the Charles River (and Boston and Cambridge) from the Mass Ave Bridge. It turns out that my future includes leaving both of these cities that I have a complicated love-hate relationship with – after a lot of thought, I accepted a job in North Carolina. I’m moving to a whole new region in a little over a week, and it feels both exciting and incredibly sad to be leaving behind both the place that I’m from and the place that I’ve grown to love over these last three years. 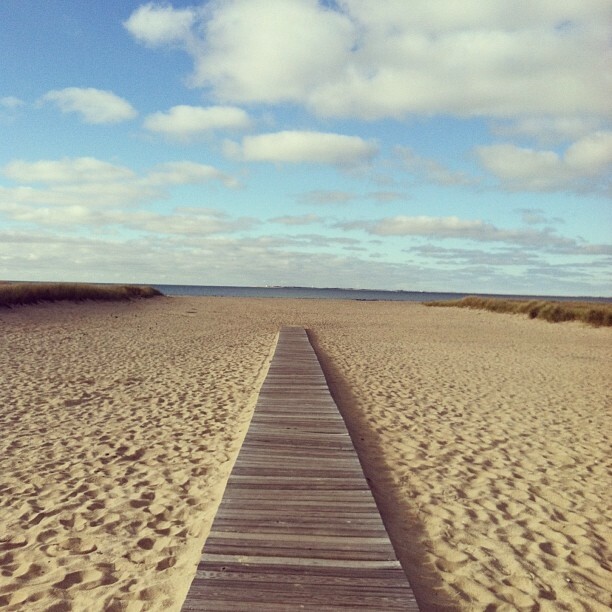 Pilgrim Beach in Truro, MA.